The cosmos among stars and alien solar systems are not a perfect vacuum at all. As a substitute, lurking between the galaxies and stars are high amounts of (mostly hydrogen) gas and dust filaments. Over a huge duration of time, these gas and dust clouds ultimately assemble into sacks, developing gigantic clouds that are so huge, even light takes hundreds of years to travel from one end of the cloud and gas to the other. 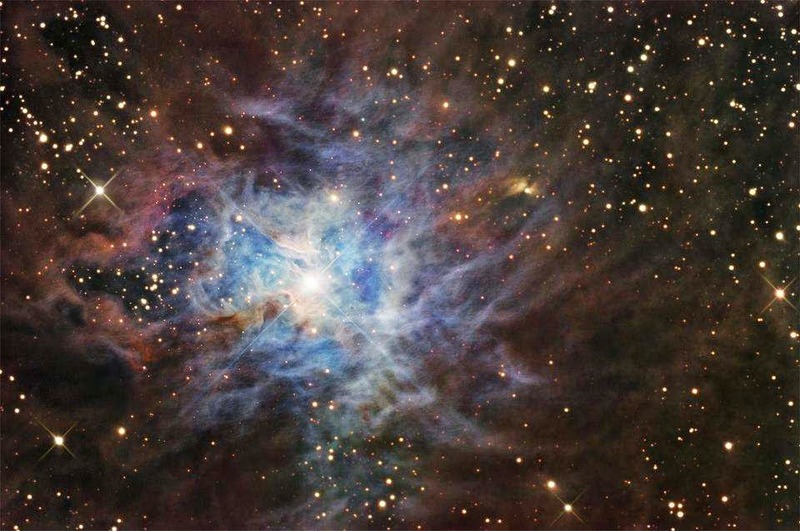 This (as shown in the picture) is one such cloud, which is identified as the Iris Nebula. It’s easy to see where it got its name as it seems to be flourishing just like so many flowers do in initial spring-time. The Iris Nebula also known as NGC 7023 or Caldwell 4 is a bright reflection nebula, which lies about 1,300 light-years from Earth and lies in the constellation of Cepheus. Astronomers thinks Iris may spread around 30 light-years across. At the core of NGC 7023 is a cluster of many stars, but not any as bright and reflective as a star named LBN 487, which can be identified easily in the center. It’s positioned near two stars. One of which, sparkles at a scale of +6.8 while the other has a scale of +3.23.